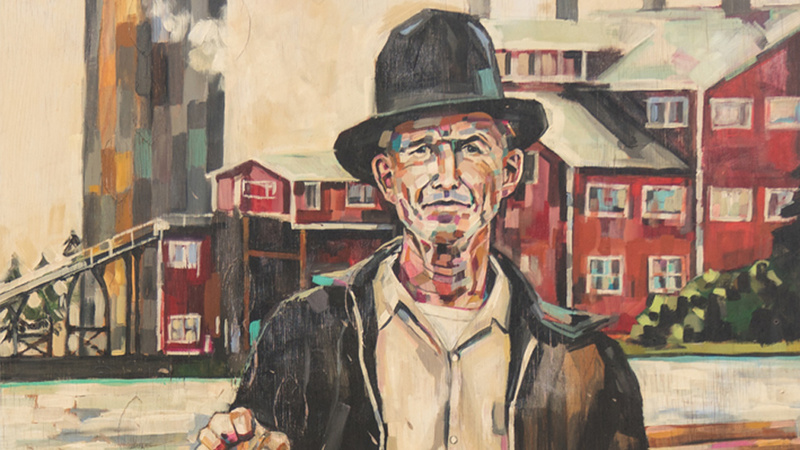 About the Piece: “The Millworker” depicts Dan MacLennan, who moved to Bend in 1909 after working in the lumber industry since age 12. He was one of the most agile workers at the sawmill, herding 80 train cars worth of logs a mile down the Deschutes river. The Peavey or Pike Pole – held in his right hand that’s missing four fingers from a previous milling accident – was used to maneuver floating logs. The artist was inspired to paint Dan because his face tells a rich story of our past. He’s one of the tireless, often faceless working class continuing to shape the Bend community in countless ways. About the Artist: Sheila Dunn is a graduate of Colorado State University and best known for her vibrant, large-scale figure work. In 2010, she moved to Bend on a whim and continues to paint amid kayaks, bikes, climbing gear (and the occasional chicken) in her friend’s garage. Her paintings can be found in homes and businesses throughout the country and internationally.